Pour on the gravy! 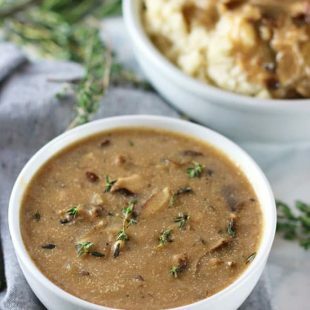 This Shiitake Mushroom Gravy is full of flavor and is perfect for your holiday table. 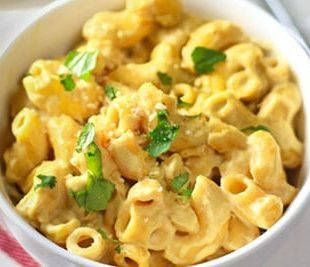 It’s easy to make, comforting and delicious! When I was young, the only time I had gravy was at holiday meals like Thanksgiving and Christmas. When I did get my paws on some, I would go nuts with it and pour it all over my whole plate. My aunt had to start making a whole another can because I’d have to have one gravy boat all to myself. And yes, I said “canned” – that’s how we used to roll. Nowadays, I like to create more homemade foods so that I know exactly what I’m getting. While fresh herbs aren’t always easy to get or can cost more, I do recommend using them. They make a big difference flavor-wise. 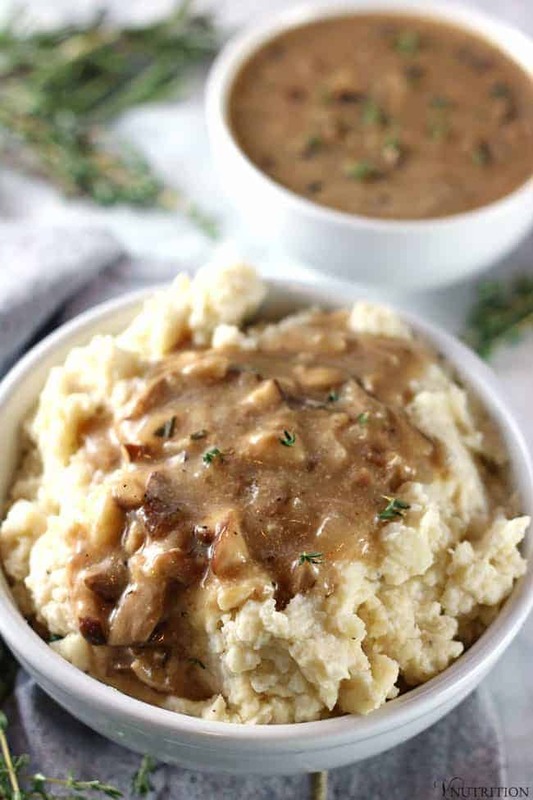 Am I the only one that used to (or maybe still do) take a big ol scoop of mashed potatoes and create a kind of well in the middle and fill it with gravy? I called it my gravy volcano. It was my favorite. I’m actually annoyed at myself that I didn’t take a picture of one. If I could have, I would only have eaten the mashed potatoes and gravy for all of my holiday dinners. 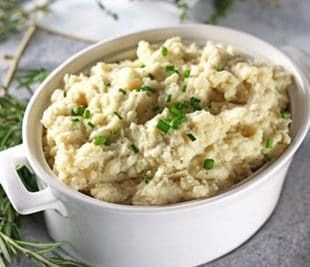 By the way, if you’re looking for some fabulously creamy yet healthy mashed potatoes check out my Cauliflower Mashed Potatoes. They use half cauliflower half mashed potatoes and they’re as creamy as all get out – no one would know they’re hiding cauliflower. 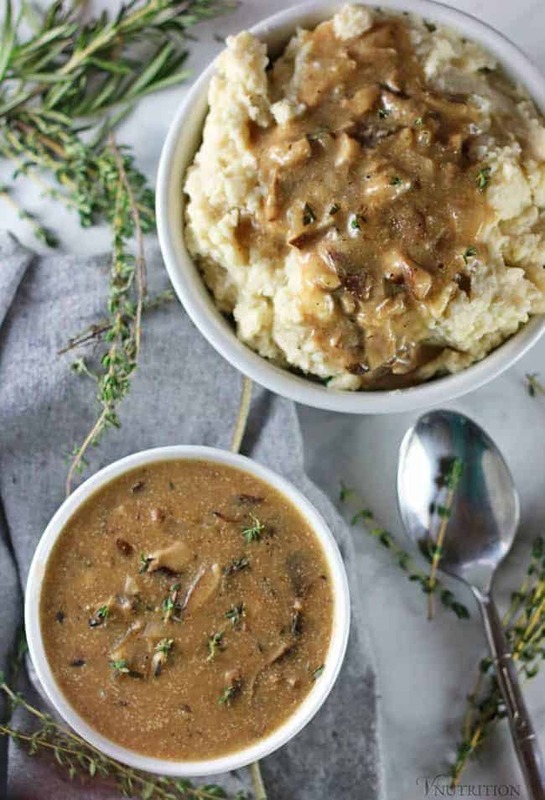 All this to say I’m loving my new Shiitake Mushroom Gravy and I think you will too! I went with shiitake mushrooms for the gravy because they are my favorite but you can sub in any kind of mushroom your heart desires. Like I said above, I was used to canned gravy growing up so making fresh gravy was really exciting. I have to say, I was very proud of myself coming up with a tasty one. Now get yourself a big plate of mashed potatoes and pour on this delicious gravy! 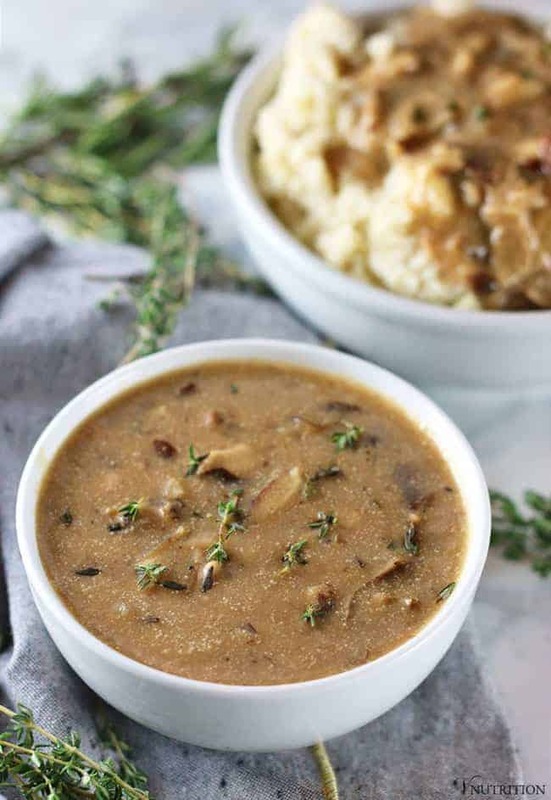 If you make this Shiitake Mushroom Gravy recipe, let me know what you think by ★ star rating it and leaving a comment below. Add olive oil and mushrooms to saute pan and cook for about 5 minutes. Add shallot and garlic to the pan and cook for another 3 minutes. Add in rest of the ingredients and bring sauce to a simmer. Reduce heat and continue cooking (and stirring) until the gravy reaches your desired consistency (3-5 minutes). Feel free to add more herbs/spices/salt to your liking. *This recipe makes about 2 cups of gravy. With as much as I adore sauces, dips, and spreads – I haven’t really ever been much for gravies! Probably because I haven’t found an awesome one! BUT…I have a feeling this one will BE that awesome one that I need to try! YAY! Looks and sounds great! Bizarrely, I’m not sure I can ever recollect eating gravy. I guess I must have had it at some point but it wasn’t something my family ate growing up, and by the time I was old enough to eat roasts and things as an adult, I was vegetarian and then in due course vegan. I will have to try this out to see what I may have been missing! 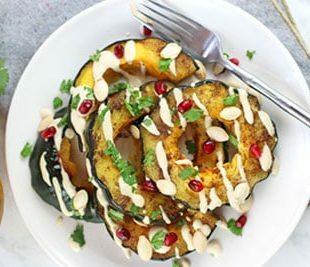 This looks wonderful and I adore vegan gravy, can’t wait to try it. Thanks! I haven’t made a meat free gravy yet– I need to get on this! Gorgeous recipe.